The National Bank of Egypt issued banknotes for the first time in 1899. 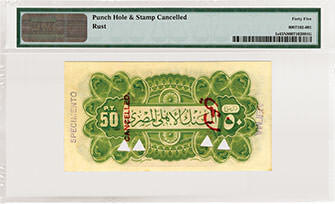 Denominations of 50 Piastres, 1, 5, 10, 50 and 100 Egyptian Pounds were introduced. The Egyptian pound (e£) is a paper currency of 100 Piastres or 1,000 milliemes. 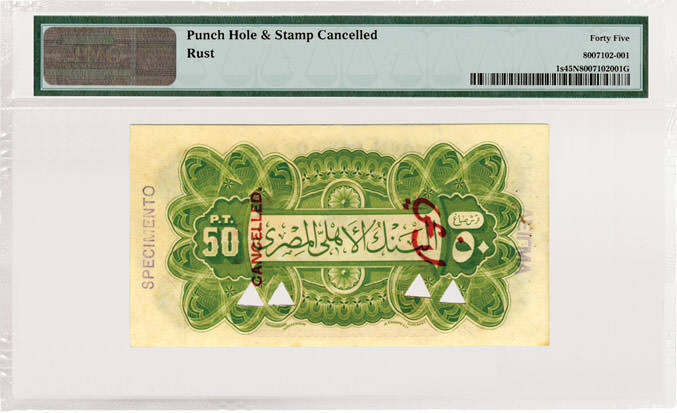 The green, black and pink 50 Piastres note pictured here features the Great Sphinx at the center of the note with an unknown Mosque Minaret to the left and an Islamic rose with the name of the National Bank of Egypt in green on the back. 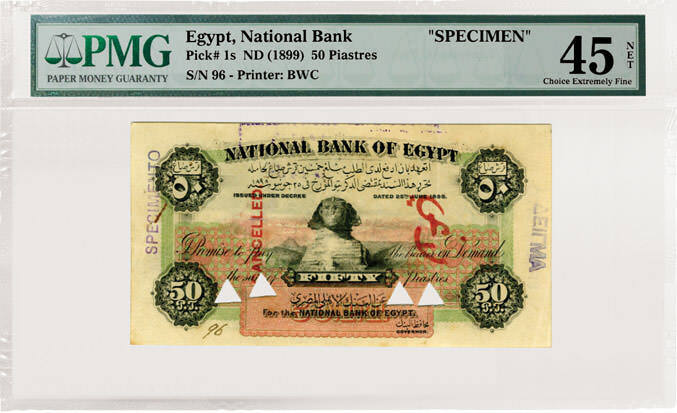 These notes were originally signed by Elwin Palmer, who was appointed the first Govenor of the National Bank of Egypt when it was newly created in 1898. In 1902 he was appointed president of the Agricultural Bank of Egypt, a subsidary of the National Bank and Frederick Rowlatt took over the position and signing responsibility. This note was printed by Bradbury Wilkinson and Company (BWC), an English engraver and printer of banknotes, postage stamps and share certificates that began operations in 1856. According to the PMG Population Report, as of November 2012, PMG has graded 2 examples of this note – the example shown which achieved a grade of 45 as well as a note that graded 64 EPQ.